← Which are the Most Iconic Lake Tulloch Waterfront Homes? I have decided to add a home improvement section to my blog based on my experience living in the Lake Tulloch area and also based on the feedback of my clients that are making improvements to their homes. Obviously something fairly amazing would lead me to make my first “home improvement” post to a real estate website. Amazing it is…… Specializing in selling waterfront second homes at Lake Tulloch definitely has its quirks. This year specifically, is the “5 Year Low” where the lake is lowered approximately 30 feet to maintain the dam and so people can do shoreline improvements if needed. This lowering is scheduled and has historically happened on schedule for a long time. Predictable, and fairly easy to remember, although I do send out a reminder to the waterfront owners, it isn't generally a huge concern. The weather is. I obviously cannot predict the weather and neither can my clients. It seems that every few years, we have a deep freeze that has the potential to break pipes, and I find myself frantically calling my clients making sure that they left their heaters on to a minimum heat. Often, I find myself turning on the heaters myself to make sure that the homes are safe from the cold. I have also found myself either fixing broken irrigation for my clients or helping contract out for repairs due to broken pipes. (That’s why I call now). I have found an easy solution. 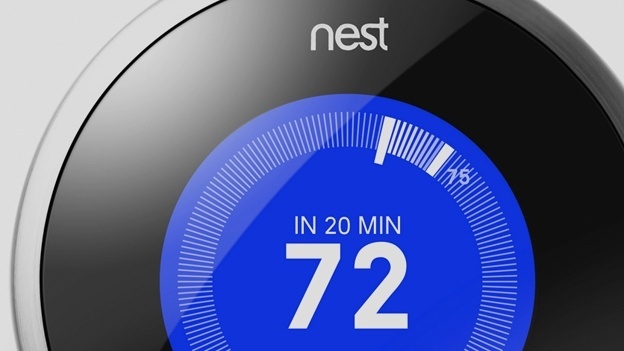 The Nest Thermostat. A lifesaver for homeowners at Lake Tulloch. The Nest thermostat was created by one of the main people behind the iPod. If you have an Apple product, I am sure that you are aware of how easy the user experience is. This thermostat feels and looks the same way. The design is amazing and is actually slightly beveled and reflective to help it blend into the wall that it is on. The Nest Thermostat blends into its surroundings. Installation is so easy, if not, call me and I will help out! 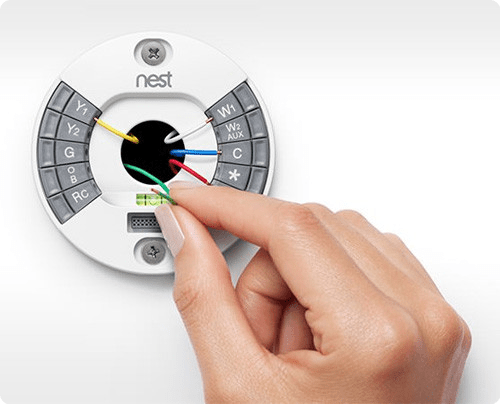 The Nest base has 8 spring loaded wire grabbers that are named for each color of the potential wires that are connected to your current thermostat. Plug in Red to R. Green to G and so on depending on how many wires that you currently have. Easy. Screw the base into the wall (there is also a backing plate if your old thermostat was painted around or damaged your sheetrock). Press the main Nest device onto the base and you are ready to configure. 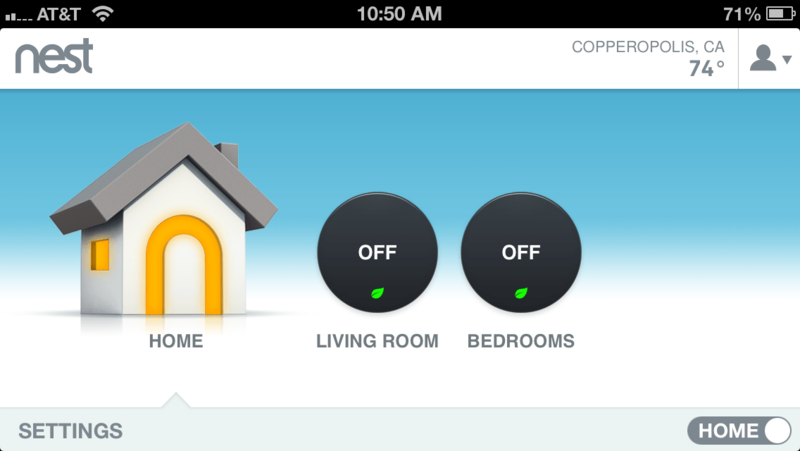 Configuring the Nest is easy. It will ask you questions, you answer, and it will configure itself. You may have to put in your network password if your network is encrypted (it should be). Download the app on your iDevice or smartphone and upon launch of the Nest App, the app will see the thermostat on the network and connect. Done. Now the cool part. The Nest will actually learn your habits for the first week or two and program itself based on your usage. With a second home, you may not be there enough to really take advantage of this, but it is really easy to set the times that you want it to run. Why it works great on a second home? 1) In the summer, you can turn on the A/C from your phone when you leave for the lake, and the home will be cool when you get here. Much better than sweating to death for the first hour or two of your stay. 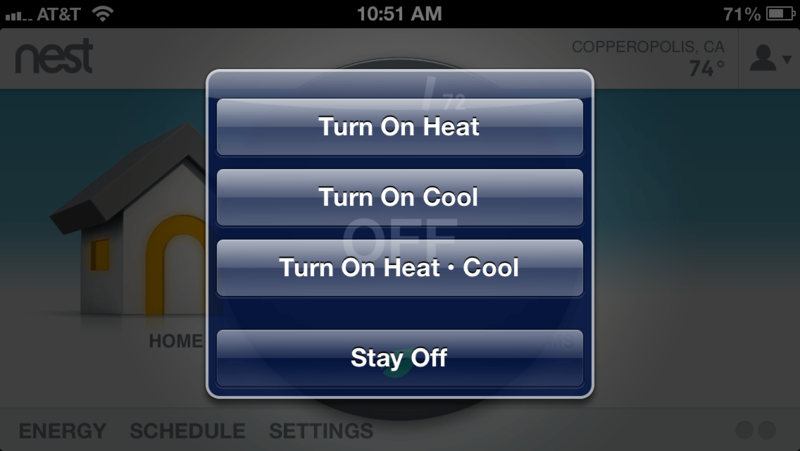 Changing the Temperature on your Nest from an iPhone. 2) If you leave to go back home, you can turn off the A/C remotely without the stress on whether or not you had actually turned it off. Turn off your HVAC remotely. Have the peace of mind knowing the A/C is off FOR SURE!! 3) You can set a base minimum temperature, so you never have to worry about freezing pipes. Nest Thermostat Minimum Temperature setting will keep your home at a minimum temperature in the event of an unexpected freeze. 4) There is also an “Auto Away” feature that turns off the system if it does not detect any movement, so if you leave on a day trip to Yosemite, your A/C won’t be running up your bill. 5) You can control multiple Nest units from your Nest App, so if your home has multiple A/C units, or if you love it enough to add another to your primary home, you can do it. 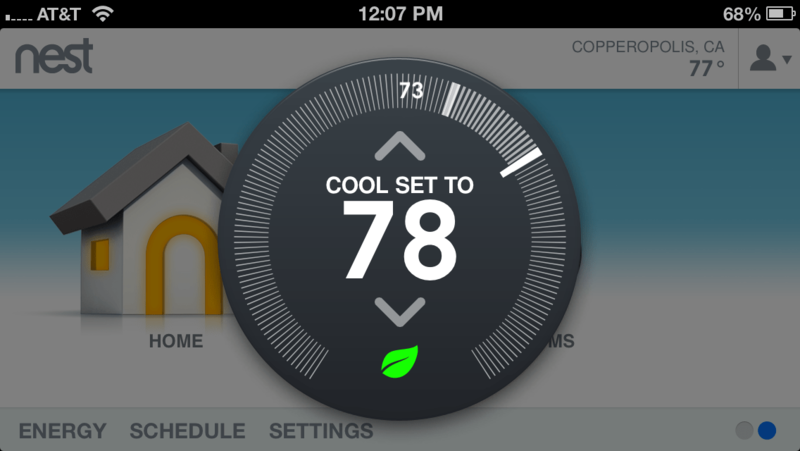 Nest iPhone App will control multiple Nest Thermostats. 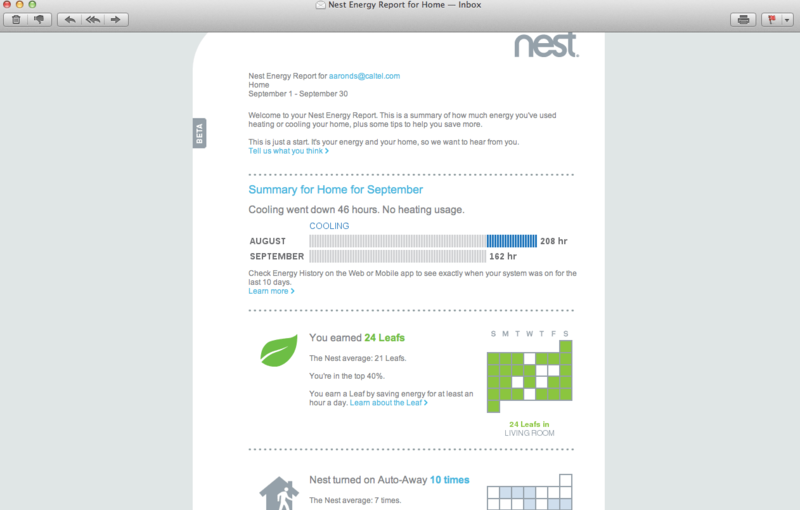 6) Nest will email you a monthly usage report to show how long the A/C was running on each day. If you have always suspected that your mother-in-law blasts the A/C at ice cold temperatures while she is using your home, now you will have proof. 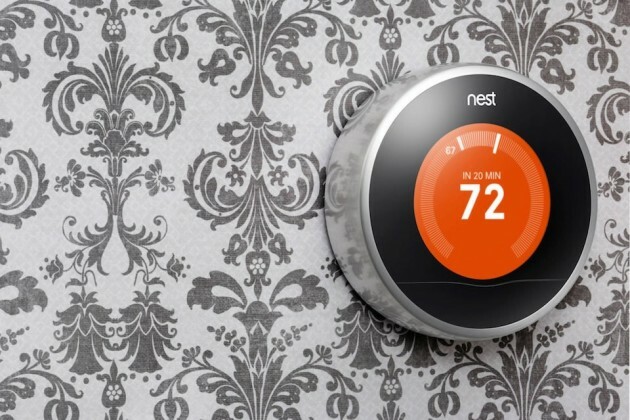 The Nest is available for $249 at Apple, Amazon, Lowes, Best Buy and at Nest. If you have any questions, feel free to ask below, or give me a call to discuss. You can also learn more at about this amazing addition to your home at Nest. If you are interested in purchasing a home in the Lake Tulloch area in which to install your new Nest Thermostat, please visit Lake Tulloch Waterfronts for more information. This entry was posted in General Real Estate Info, Home Improvement, Lake Tulloch and tagged 95228, Aaron Stafford, Android, Calaveras County, Copperopolis, Home Improvement, iPhone, Lake Tulloch, Lake Tulloch Real Estate, Nest Thermostat. Bookmark the permalink.